Note that the photographs depicted on this web page may be enlarged for more detailed viewing by moving your cursor to the photo and clicking on the image. In early June of 2011 the maintenance supervisor (K G) at one of my commercial client sites in Round Rock, Texas, called to report that a number of odd-looking bugs had suddenly appeared in the facility’s kitchen pantry. The dietary supervisor was naturally concerned at the appearance of any kind of live animal in her pantry, but she especially feared these might be newly-hatched cockroaches. That suspicion was ruled out, however, by the cursory description that K G provided to me over the phone. My work that day had taken me 250 miles away, to two nursing facilities in north Texas, and would not bring me back to Round Rock until late that evening. On learning this, K G offered to collect a few specimens for me to examine the next day. That next day, K G’s specimen was picked up and examined briefly at the client’s location. It appeared to be a true bug in the order Hemiptera (from the Greek ἡμι– = hemi; “half” and πτερόν = pteron; “wing”, referring to the forewings of many insects in the taxonomical suborder known as the Heteroptera (Greek ετερο = hetero; “different”, a reference to the fact that the forewings and hindwings of such insects are morphologically dissimilar) which are hardened near the base, but membranous at the ends. Once established as a hemipteran, an obvious concern was that this might be an assassin bug in the Reduviidae family, or an ambush bug in the Phymatidae family. 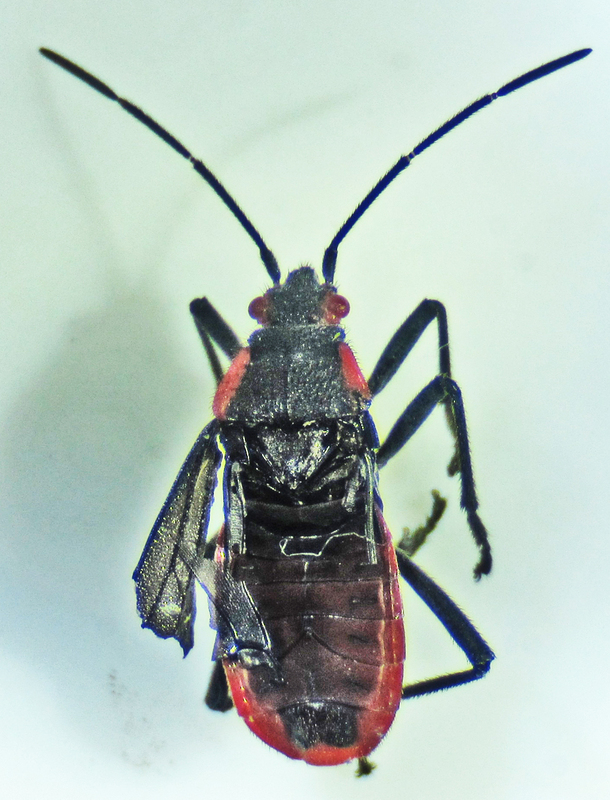 Certain species in these families, particularly the conenose bugs in the Triatominae subfamily within the Reduviidae, are hematophagous (feeding on the blood of vertebrate hosts), and — besides the obvious negatives associated with such behavior — are also capable of transmitting the Chagas parasite from an infected human host to another human host. 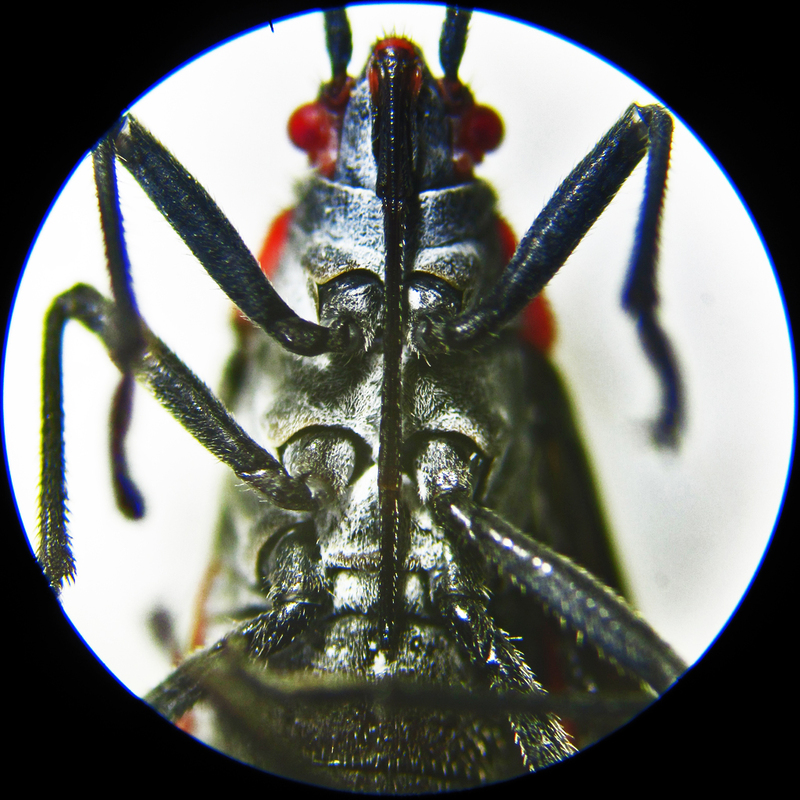 However, that concern was immediately eliminated by noting that the head was not fitted with a cone-shaped proboscis (this specimen’s anterior head was rather blunt, by comparison to that of the conenose bugs), and that the lateral margins of the abdomen were not flared outward in the remarkable way typical of members of the Triatominae. That concern having been put to rest, the next question devolved to why this “most-likely-harmless-to-humans” bug might have ended up in this facility’s kitchen pantry. This specimen had typical hemipteran wings, delicately membranous in their major proportions, but hardened at their attachments to the body and, at rest, held flat over the body. As just mentioned, no proboscis could be seen dorsally with the naked eye, suggesting the presence, instead, of a ventrally visible beak that would be observable under magnification. 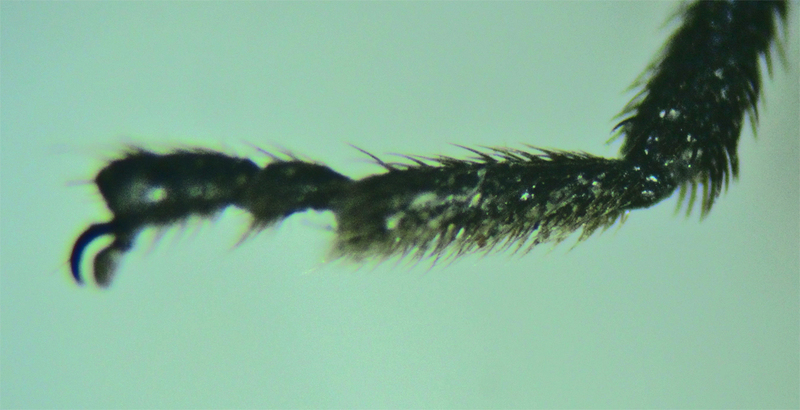 The antennae were visible, longer than the head, thus placing this specimen within the long-horned bugs, described in the 1970 Peterson Field Guide to the Insects as the suborder Gymnocerata (Greek γυμνος = gymnos; “uncovered, naked, bare” + Gr. –κερας = ceras; “horn”, ref. the exposed antennae.) 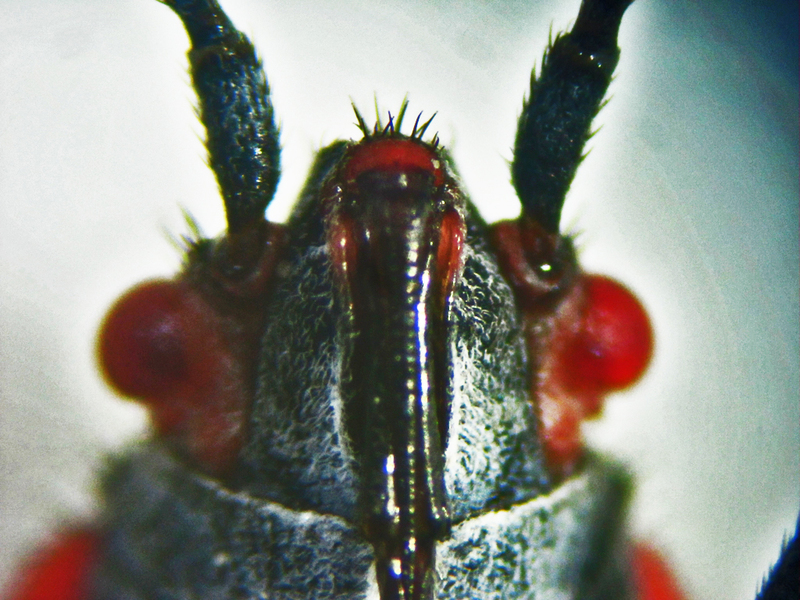 As the foregoing might suggest the language and direction of bug taxonomy is presently undergoing significant revisions, and many older — not to mention many newer — taxons in dispute. The suborder Heteroptera as presently (2011) defined by some authorities includes some 25,000-40,000 species, depending on the way the term is relegated within the order. In other words, unless this specimen was an easily recognized pest of some repute, chances of identifying it to species were slim without consulting with an expert hemipterist. Identifying it to family, and possibly to genus, though, would likely be rather good, even with the meager resources available in my humble laboratory. Thereafter, back at that lab, K G’s specimen was immersed in 70% ethanol with a few drops of glycerin added, and allowed to stand for a few hours. Later, under the dissecting microscope, the wings were partially removed to show the dorsal abdomen. Fig. 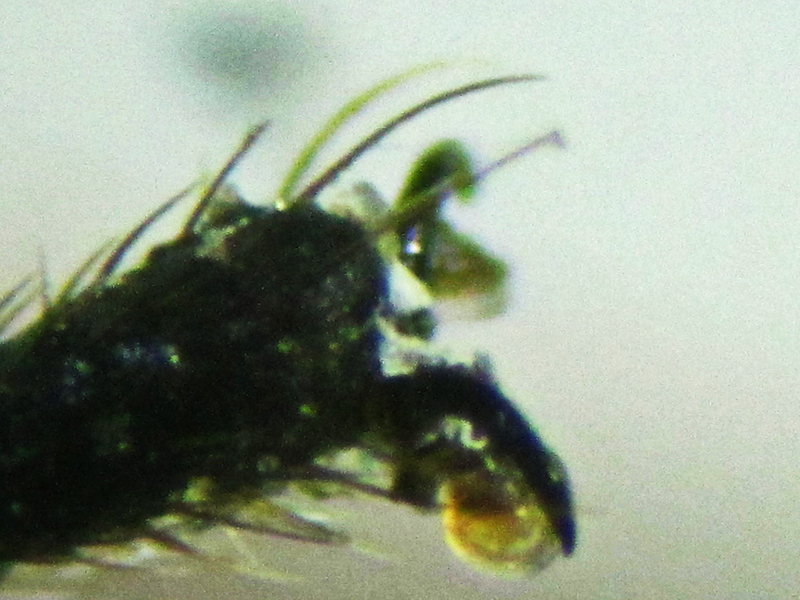 001, above, depicts the dorsal body divided into a separate head, thorax, and abdomen, with its relatively long antennae divided into four discernible segments. Fig. 007 shows a beak divided into four discernible segments as well. The tarsi, as shown in fig. 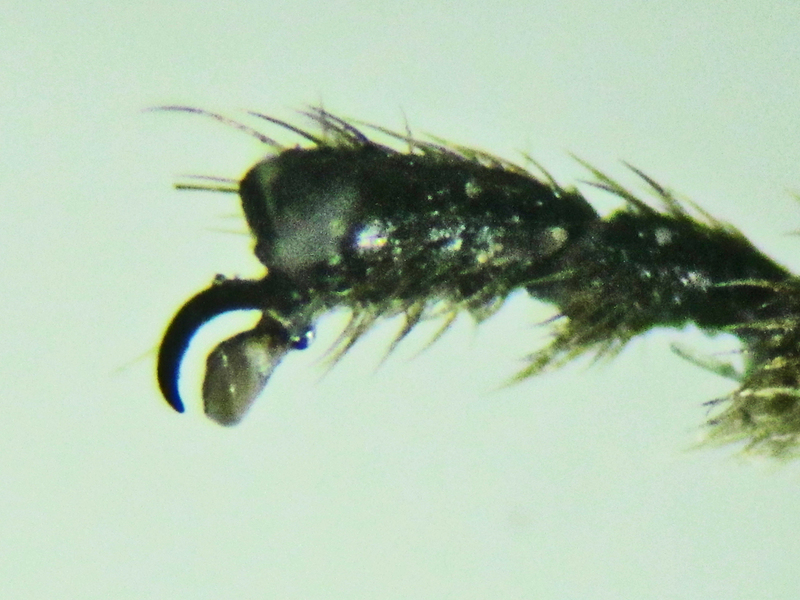 008 for leg IV, is comprised of three segments, with two claws, each of which has a separate pad at its base (figs. 009 & 010). Fig. 002 depicts the ventral body. Fig. 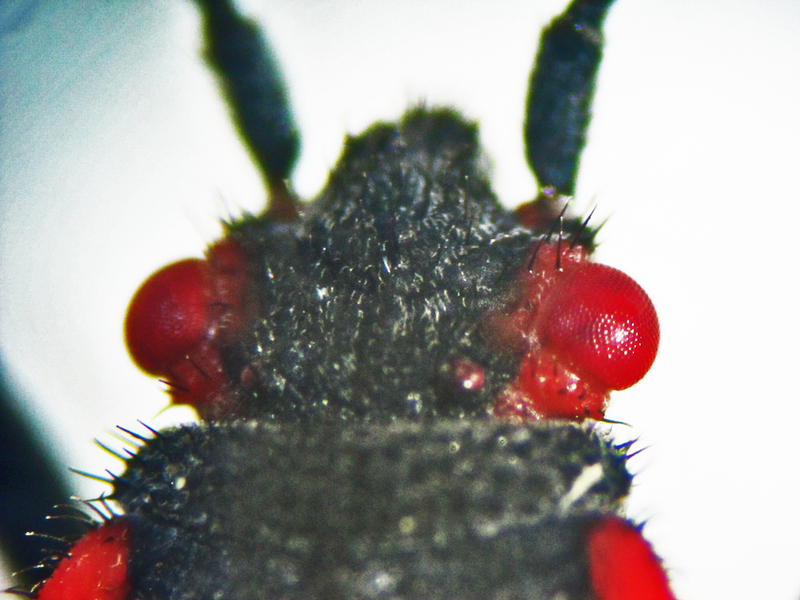 004, of the dorsal head, clearly shows two prominent, bulbous, reddish compound eyes and two smaller red ocelli nearby. Fig. 005 depicts the ventral head, with the first segment of the beak where it attaches to the head. Further investigation revealed that this bug was almost certainly a member of the Lygaeidae family, in the superfamily Lygaeoidea, and the infraorder Pentatomomorpha. 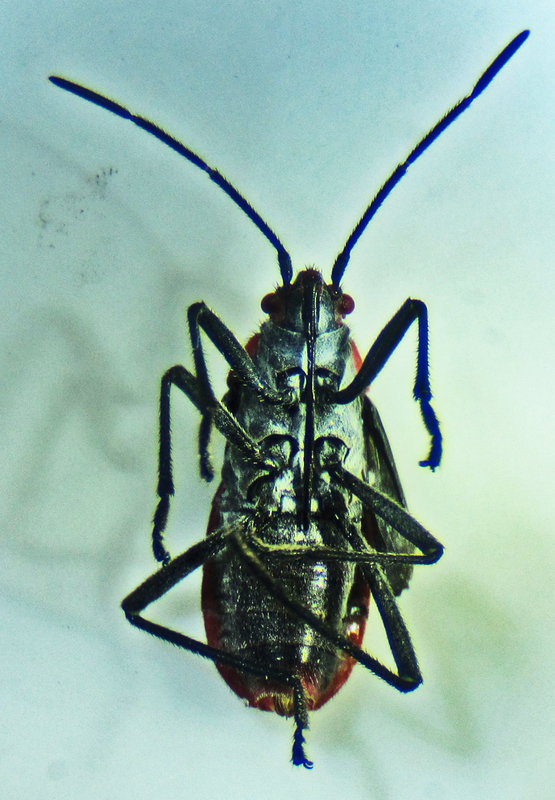 The Lygaeidae is comprised of some 60 genera in six subfamilies, including the milkweed bugs and the seed bugs. Worldwide this family comprises more than 3,000 recognized species; in North America more than 250 recognized species have been described, making it the largest hemipteran family on this continent. Most are phytophagous, feeding on the sap of plants and seeds. This bug probably happened into this pantry as a hitchhiker on vegetables brought in during a recent delivery.